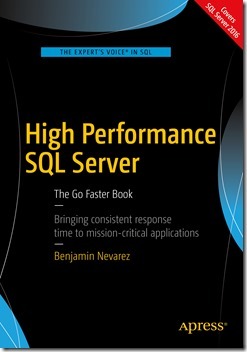 I am very excited to announce that my new book, High Performance SQL Server, is now available on Amazon and, in this post, I include the Introduction of the book, which covers what this book is about and describes the content of each of its nine chapters. I’ve been writing and presenting about query tuning and optimization for years. I even wrote a book on the topic called SQL Server 2014 Query Tuning and Optimization. Query tuning and optimization is extremely important to improve the performance of your databases and applications. Equally important is having a well-designed and configured system in the first place. SQL Server default configuration can work fine for some applications, but mission critical and high-performance applications demand a thoughtful design and configuration. Well-written and tuned queries will not shine if a system is not properly configured. For example, queries will not use processor resources in an optimal way if a maximum degree of parallelism setting is not configured correctly. Database performance will suffer if a database is using the default file auto-growth settings or if the storage is not properly configured. A misconfigured tempdb may show contention on many busy systems. Even the query optimizer will struggle with a bad database design or badly written queries. These are just some common configuration problems out there in real production systems. In addition, even when a well-designed application goes to production, performance tuning does not end there. Monitoring and troubleshooting are an extremely important part of an application and database life cycle since performance problems eventually will arise. Workloads may change, hopefully for the better (for example, an application having to deal with an unexpected increase on business transactions). Sometimes those changes will require a redesign, changes, and perhaps new configurations. So this is, in fact, an iterative process, consisting of design and configuration, followed by implementation, monitoring, and troubleshooting, which again may lead to new designs or configurations, monitoring, and so on. In addition, collecting performance data, creating a baseline, and performing trend analysis is an important part of a production implementation, not only to troubleshoot problems but also to anticipate issues or understand future growth and additional requirements. It is essential to estimate and trend those changes proactively instead of waking up to a system suddenly having trouble in handling changing workloads or, even worse, to face a downtime that could have been avoided. There are several tools to help with this, and the great news is that SQL Server 2016 offers a very promising one called the Query Store. I spent a good part of my daily job working on all these items so I decided to write a book about them. I wanted to cover everything you need to know about performance in SQL Server that does not require you to know about query tuning, work with execution plans, or “fight” the query optimizer. There are so many areas to cover and more are being added as new features and technologies appear on SQL Server such as In-Memory OLTP, columnstore indexes, and the aforementioned Query Store. This book covers all currently supported versions of SQL Server with a major focus on SQL Server 2016. Although this is a performance book from the practical point of view, SQL Server internals are very important too. The best way to troubleshoot something is to know how it works and why things happen. Consequently, I focus on internals when required. Finally, this book complements my query tuning and optimization book. If you are a database developer or a SQL Server professional who cares about query performance, you could benefit from both books. If you are a database administrator, a database architect, or even a system administrator, and you want to improve the performance of your system without query tuning, you can read only this book. As mentioned earlier, understanding SQL Server internals is important to better optimize a system and troubleshoot database problems, so this book starts explaining how the SQL Server database engine works and covers everything happening in the system from the moment a connection is made to a database until a query is executed and the results are returned to the client. Chapter 1 includes such topics such as the Tabular Data Stream (TDS) and network protocols used by SQL Server, SQLOS, and the work performed by the SQL Server relational engine, focusing on query processing and the most common query operators. Waits happen in an SQL Server instance all the time. Chapter 2 introduces the waits performance methodology, which can be used to troubleshoot performance problems, especially when other methods are not able to pinpoint a performance issue. Chapter 3 covers the Query Store, a very promising query performance feature introduced with SQL Server 2016. The Query Store can help you to collect query and plan information along with their runtime statistics, which you can use to easily identify query-performance-related problems and even force an existing execution plan. The chapter closes by mentioning some related new features such as the Live Query Statistics and the SQL Server Management Studio plan comparison tool. Chapter 4 explains a number of instance level configuration settings that can greatly impact the performance of your SQL Server implementation. As an interesting fact, it shows how some trace flags originally introduced to solve a particular problem are now implemented as SQL Server configuration defaults. Chapter 5 covers tempdb configuration, which is especially important as such a database is shared between all the user and system databases on a SQL Server instance. Focus on the chapter is given to tempdb latch contention of allocation pages and tempdb disk spilling, a performance issue that occurs when not enough memory is available for some query processor operations. In-memory technologies are introduced in Chapter 6, including In-Memory OLTP, which in SQL Server 2016 sees its second release, and columnstore indexes, now on its third mayor implementation. Both features suffered severe limitations with their original release so this chapter covers how these technologies work and what their current improvements are. The chapter ends with Operational Analytics, which combines both technologies to allow analytical queries to be executed in real-time in an OLTP system. In-memory technologies promise to be the future in relational database technologies. Chapter 7 shows how proactively collecting and persisting performance information could be extremely beneficial to understand how a specific system works, to create a baseline, and to understand when performance is deviating from a desirable or expected behavior. The chapter also covers the most critical performance counters, dynamic management objects, and events, along with some of the tools used to display and collect such data. Indexing, a required topic for database performance, is covered in Chapter 8. It explains how indexes work and why they are important on both OLTP and Data Warehouse environments. The chapter provides emphasis on using SQL Server tools to help create indexes such as the missing indexes feature and the more sophisticated Database Engine Tuning Advisor. Finally, SQL Server storage is explained in Chapter 9. Disk has traditionally been the slowest part of a database system, but newer technologies such as flash-based storage offer great performance improvements and are becoming a de facto enterprise standard as their cost continues to decline. The chapter also indicates that storage optimization is not only about using the fastest disk possible but also minimizing its usage by implementing the methods covered in several chapters of the book, such as proper indexing or some query tuning techniques.